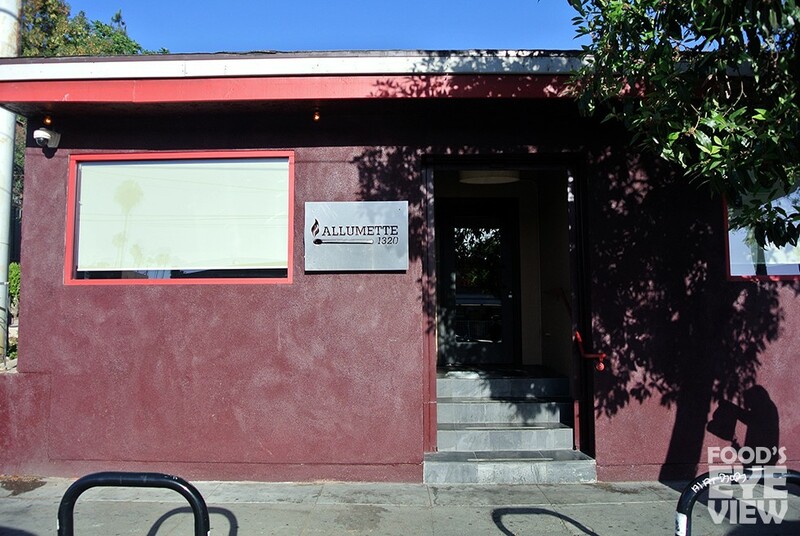 It’s been a hell of a year and almost five months for Chef Miles Thompson and his crew at Allumette. With the same quickness that they burst onto the LA dining scene back in 2013 they are now set to close with Saturday June 28 as the restaurant’s final service. Despite favorable praise early on from Los Angeles Magazine (10 Best New Restaurants of 2013) and Bon Appètit (50 Best New Restaurants of 2013), plus landing at #51 on Jonathan Gold’s 101 Best Restaurants list this year, Thompson’s adventurous restaurant just never quite caught on in Echo Park. Did the 26-year-old’s inventive brand of cooking go over the heads of many of the customers who walked in the door? Perhaps. 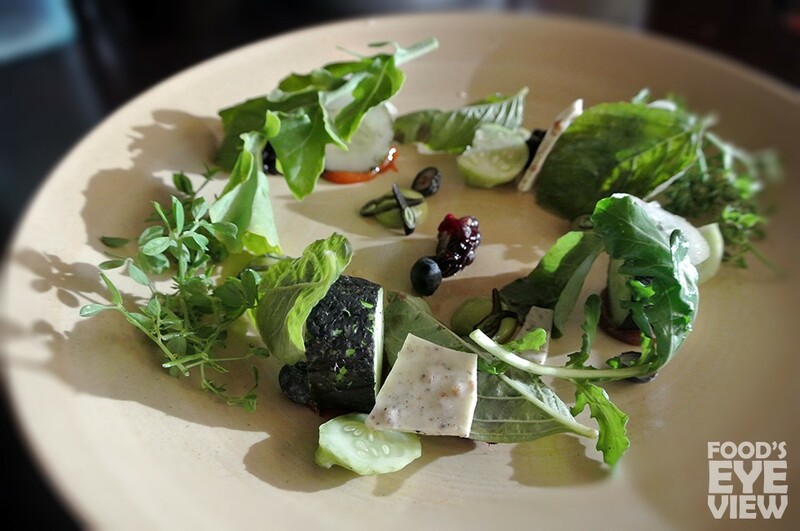 Even with the recent switch to a very reasonably priced (considering the level of cooking and ingredients) tasting menu at $45 and $60, it was still a pricey meal for the area which no doubt was a factor in the decision to close the doors. Considering this meal marked both my first and last time dining at Allumette, the full 5-course tasting menu was a no-brainer to experience the full depth of Thompson’s cooking. Fortunately, my dining companion was happy to share everything meaning I was able to sample every dish that was part of the tasting. The beverage pairing was enticing but in the end we decided to order cocktails and drinks on our own, all of which were top notch thanks to Serena Herrick (formerly of Pour Vous and Harvard & Stone). The space itself is very plain, but in a way it works so that the colors and textures that arrive from the kitchen are that much more vibrant and attention-grabbing. 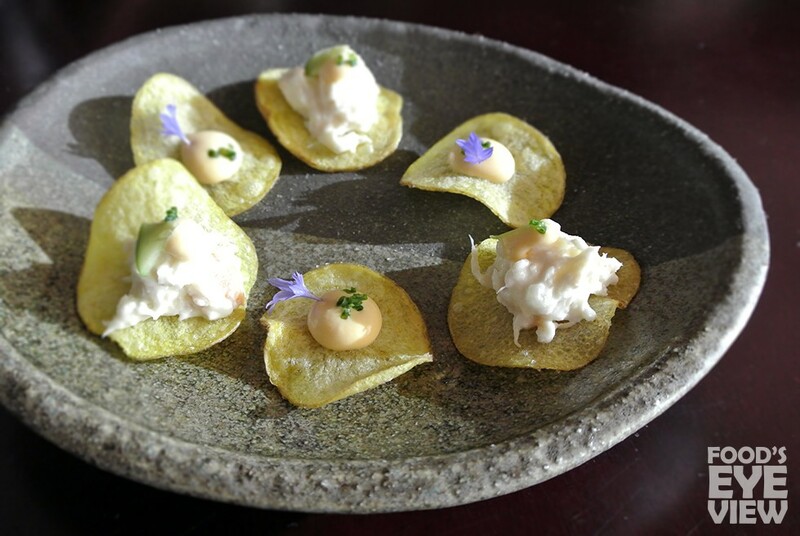 Before the tasting menu commenced we started with a plate of potato chips from the snacks side of the menu. Light with a satisfying crunch, the chips were good enough on their own to eat an entire bag’s worth , but when alternatingly topped with smoked whitefish and an uni cream they were like chips ‘n dip on steroids. The smoked whitefish in particular reminded me of an upscale sour cream and onion dip in the best possible way. 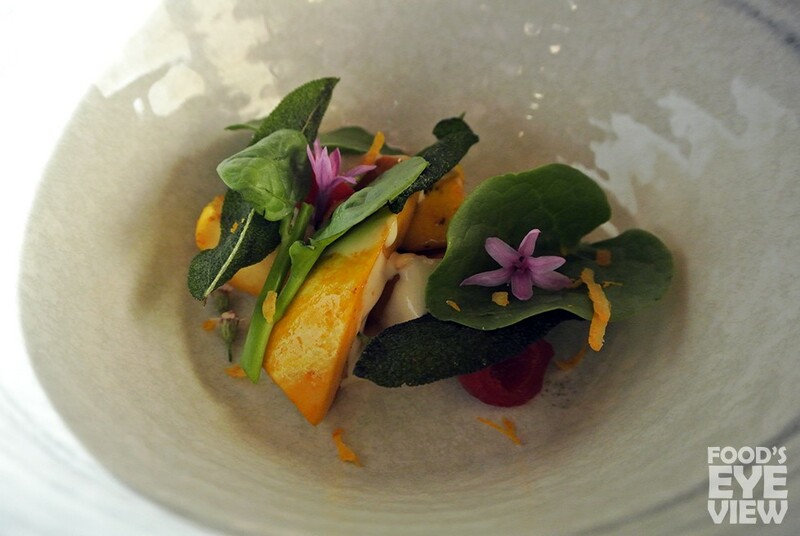 A concentric cucumber “salad” of sorts displayed a playful, summer vibe with the sweetness of white chocolate and an apricot compote playing off the slightly bitter berries and sprigs of greenery. 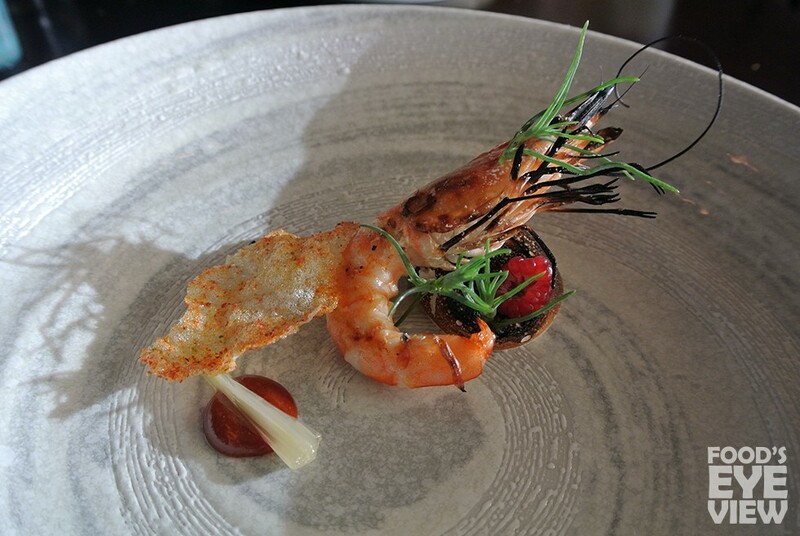 Although the perfectly grilled prawn was the focal ingredient here, it was the flavor-packed vinegar meringue that garnered the ooh’s and aah’s at our table as it provided a bracing counterpoint to the prawn’s natural sweetness. Pieces of summer squash were particularly meaty and substantial, while the velvety white corn fondue and garlicky undertones offered some depth to the dish. 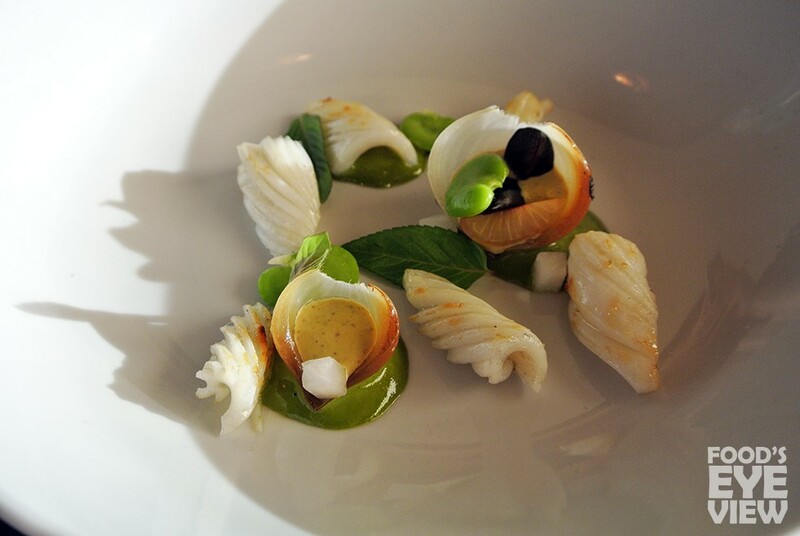 Mini-scrolls of supple arrowtip squid were fantastic, but it was the combination of tiny onions with a pistachio ponzu that stole the show here, an incredible combination of flavors that I’m still thinking about days later. 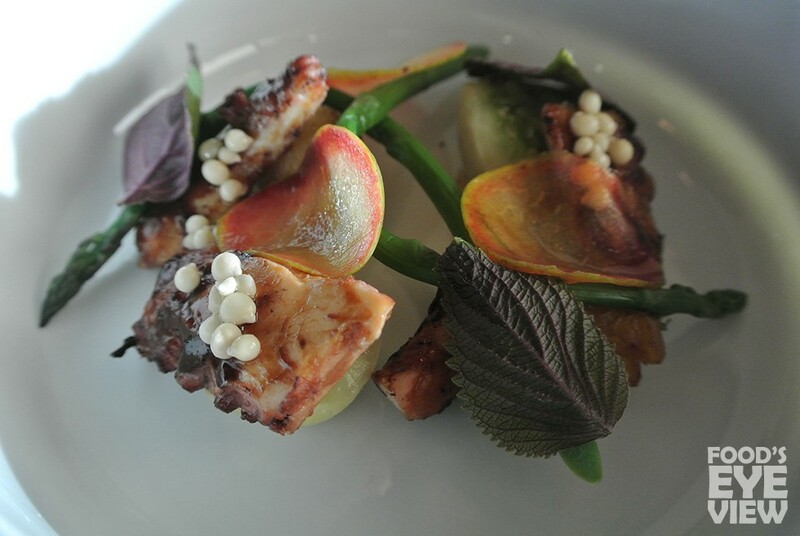 Everybody seems to be doing grilling or barbecuing octopus in some form these days, but Thompson’s version was simply one of the best, tender and a touch sweet with a great smoky char from the grill. Okra “caviar” added a pleasant pop to go along with the thin stalks of asparagus and paper-thin slices of sweet plum. 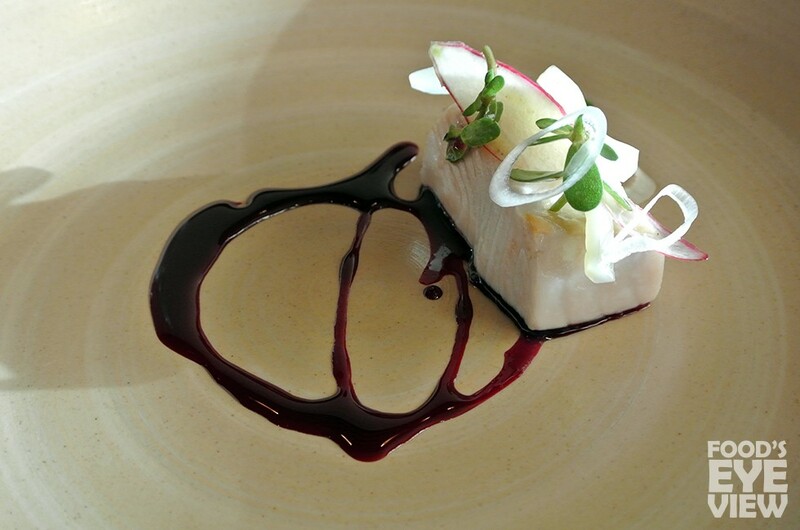 One of the few courses that just didn’t resonate very strongly was the king salmon. It was wonderfully cooked with a moist center and flaky flesh, but the beet syrup was too sweet for my liking and dominated the other components. 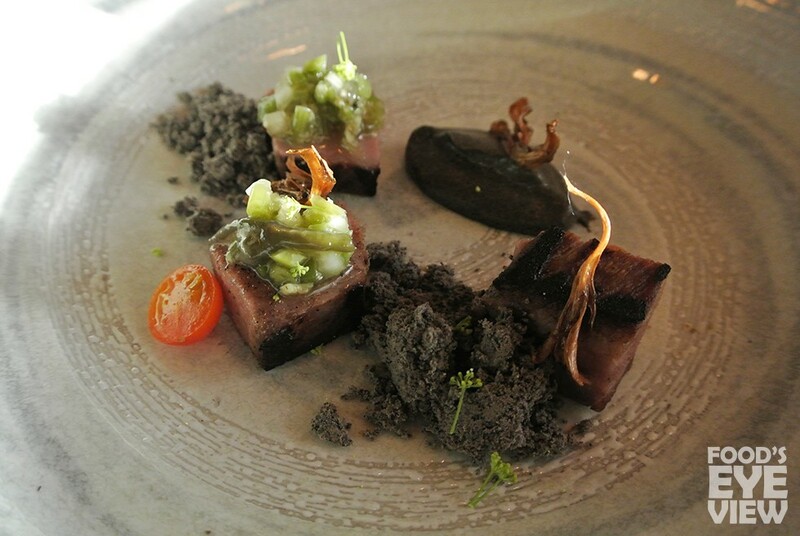 I loved that Thompson chose to work with pork collar here when he very easily could’ve settled for pork belly, resulting in a meatier bite that was just as flavorful with the added fattiness. The pho charcoal was interesting, but the eggplant mayo was exceptional and paired beautifully with the bites of pork and even heat of the pickled wasabi. 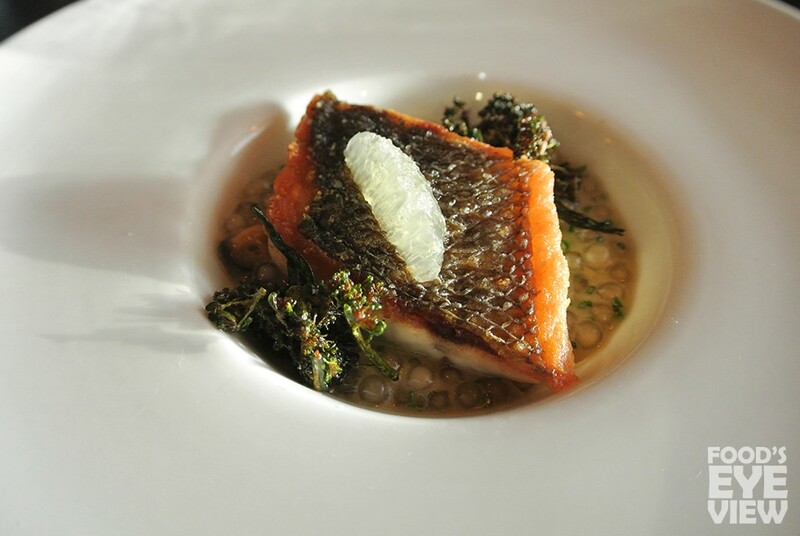 There was nothing wrong with the lovely piece of branzino here – crispy skin, succulent flesh – but it was the shellfish tapioca that was the single-best bite of the entire evening. How or why Thompson decided to infuse the squishy little spheres with the essence of seafood remains a mystery, but the fact is that it flat out worked, and worked well. 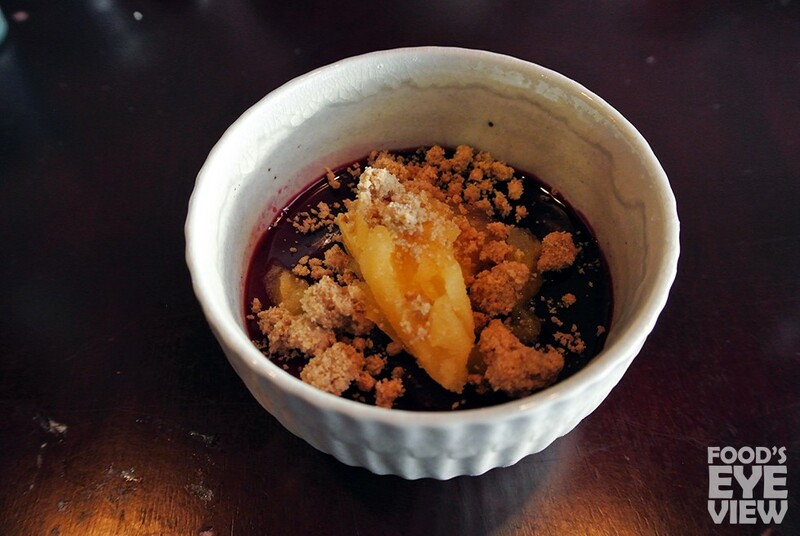 The bavarois was a well-balanced blend of sweet and tart with the oat crumbles providing a contrasting crunch. My favorite of the pair of desserts was the pot-de-crème, a smooth and not-to-sweet version of the French custard, that in fact was the best preparation of the dessert I’ve had to date. While it isn’t exactly a shock that Miles Thompson’s visionary cooking didn’t quite match up with the Echo Park neighborhood where it was being served, it’s still a shame to lose a good restaurant. 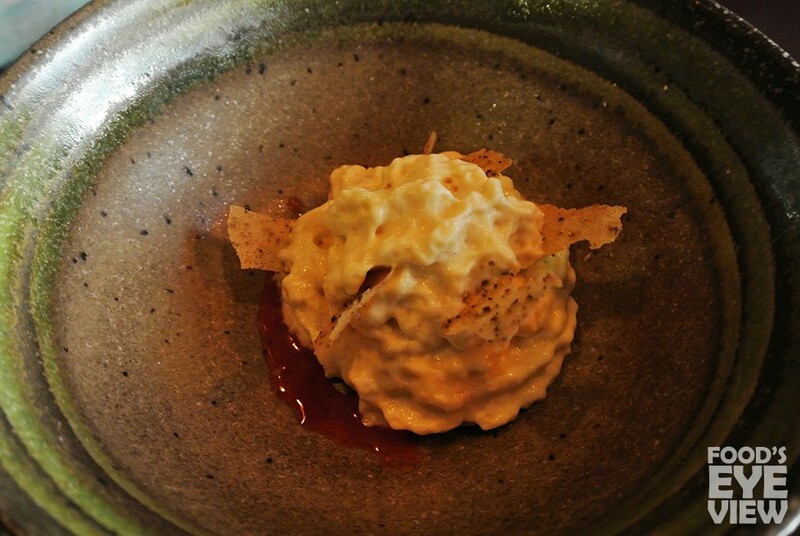 However, I prefer to look at the end of Allumette as the beginning of something new, as Chef Thompson is simply too talented not to bounce back on his feet ready to build off of this experience. In a city as restaurant-crazed as Los Angeles, the demand for the 26-year old’s food all but ensures that we’ll be hearing from Thompson again sooner rather than later.